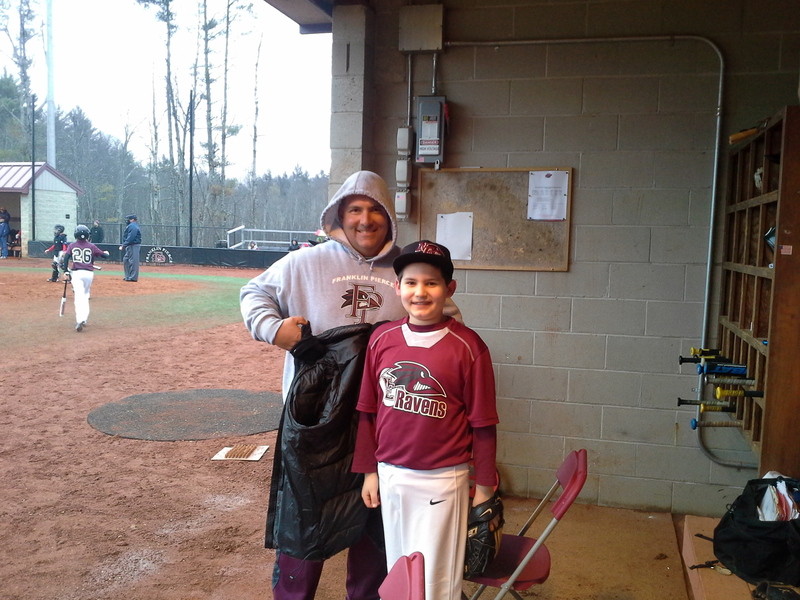 The Ravens are proud to welcome new 10U Coach, Kyle Hood back to the program. Prior to attending Franklin Pierce, Hood played for the 18U NE Raven program. He will serve as 10U Coach for the 2017/2018 season. Through the end of his junior season, ranked 17th all-time in program history in stolen bases (37). Among program single-season records, through the end of his junior season, was tied for 19th in hit-by-pitch (10, 2015). As a Junior in 2016: Played in 39 games for the Ravens, including 29 starts at second base…NCAA East Regional All-Championship Team selection…Finished 15th in the Northeast-10 Conference in walks (23)…Hit .306/.473/.398 over 98 at-bats (30-for-98) with six doubles and one home run…Scored 25 runs, drove in 18 and tallied 39 total bases…Drew 23 walks and was hit by nine pitches, against 11 strikeouts…Hit one sacrifice fly, laid down three sacrifice bunts and went 11-for-14 in stolen bases…Went 0-for-5, but drew a walk, scored twice, drove in a run and stole two bases in the front end of a doubleheader against Bentley on 4/16…Hit 1-for-3 with two walks, scored twice, drove in two runs and stole a base in the second game of a doubleheader at Assumption on 4/23…Hit 5-for-18 (.278) over a five-game hitting streak from 4/16 through 4/23…Went 2-for-3 with a double and a walk, scored once and drove in a run at Southern New Hampshire on 4/27…Hit 1-for-3 with two walks, scored twice and drove in two more runs in the second game of a doubleheader against Merrimack on 4/30…Went 2-for-4, scored twice and stole two bases in the front end of a doubleheader at Saint Michael’s on 5/4; in the second game, went 1-for-3 with two walks, scored twice, drove in two runs and stole a base…Hit 1-for-2 with two walks, scored three times and stole a base at Saint Michael’s on 5/5…Hit 11-for-26 (.423) over a nine-game hitting streak from 4/27 through 5/5…Hit 3-for-3 with a double, a two-run homer and a walk, scored twice and drove in three runs in the NCAA East Regional against Felician on 5/20…Went 1-for-3 with a double and a walk, scored one run and drove in four in the NCAA East Regional against St. Thomas Aquinas on 5/21…Went 2-for-4 and stole a base at the NCAA Championship National Finals against Nova Southeastern on 5/28. As a Sophomore in 2015: Started all 52 games at second base for the Ravens…Fall Northeast-10 Commissioner’s Academic Honor Roll selection…Finished tied for seventh in the Northeast-10 in hit by pitch (10), tied for 13th in stolen bases (17), tied for 16th in runs batted in (29) and ranked 20th in runs scored (32)…Finished third on the team in hit by pitch…Hit .263/.357/.339 over 171 at-bats (45-for-171) with six doubles, two triples and one home run, scored 32 runs and drove in 29…Drew 16 walks against 27 strikeouts, had two sacrifice flies, had one sacrifice bunt and went 17-for-21 in stolen bases (81.0%)…Went 2-for-3 and scored a run against Chestnut Hill on 2/21…Hit 2-for-4 with a double and scored a run against Mercy on 2/22…Went 1-for-2 with a walk, was hit by two pitches, stole three bases and scored twice against Dominican (N.Y.) on 3/15…Later on 3/15, hit 3-for-4, scored once, drove in two runs and stole a base against Dowling…Hit 2-for-3, score one run and drove in another against Dominican (N.Y.) on 3/17…Went 2-for-5, drove in two runs and stole a base at Mount Olive on 3/18…Went 1-for-3 with a pair of walks and scored three runs in the front end of a doubleheader against Saint Michael’s on 3/29…Hit 2-for-3 with a double and a triple, was hit by a pitch, scored three runs, drove in another and stole a base against American International on 4/1…Went 2-for-3 with a walk, scored once, drove in two runs and stole a pair of bases in the second game of a doubleheader against Saint Rose on 4/11…Hit 2-for-5, drove in a run and stole a base against Saint Anselm on 4/14…Went 2-for-3, drove in a run and stole a base in the front end of a doubleheader against Assumption on 4/25; slugged 4-for-4 with a pair of doubles, scored twice and drove in a run in the second game…Named to the Northeast-10 Weekly Honor Roll for the week ending on 4/26…Hit 9-for-17 (.529) over a five-game hitting streak from 4/25 through 5/1…Hit 2-for-4 with a walk, scored once and stole two bases against Southern New Hampshire in the NCAA Championship East Regional on 5/16. As a Freshman in 2014: Played in 48 games for the Ravens, including 44 starts, primarily at second base…All-Northeast-10 Conference Second Team selection…Northeast-10 Conference All-Rookie Team selection…Fall Northeast-10 Conference Commissioner’s Academic Honor Roll selection…Finished tied for second on the team in triples (2) and on-base percentage (.380)…Hit .288/.380/.349 with over 146 at-bats (42-for-146) with five doubles, scored 19 runs and drove in 26…Drew 17 walks against 29 strikeouts, was hit by six pitches, hit two sacrifice flies, had one sacrifice bunt and stole nine bases in 13 attempts (69.2%)…Made his collegiate debut as a defensive replacement in the seventh and was hit by a pitch in his only plate appearance against Caldwell on 2/21…Made his first career start and went 0-for-1, but drew three walks and stole two bases at Queens on 3/7…Went 3-for-3 with his first career hit — a single to right-center in the third — drew a walk and stole a base in the first game of a doubleheader at Dowling on 3/8…Hit 2-for-2 with a double — his first career extra-base hit — drew a walk, was hit by a pitch, scored a run and drove in two in the second game of a doubleheader at Dowling on 3/9…Named to the Northeast-10 Weekly Honor Roll for the week ending on 3/9…Hit 2-for-4 and drove in a run at Saint Leo on 3/15…Knocked 2-for-3 with a triple and a walk, scored twice and drove in a run against Lock Haven on 3/18…Hit 10-for-22 (.455) over a six-game hitting streak from 3/19 through 3/27…Went 2-for-3 with a walk and drove in a run in the first game of a doubleheader at Adelphi on 3/22…Knocked 2-for-3 with a double, scored a run and drove in two in the first game of a doubleheader at Pace on 3/23; later, went 2-for-4, scored one run and drove in another in the second game…Named to the Northeast-10 Weekly Honor Roll for the week ending on 3/23…Hit 3-for-4, scored a run and drove in a run in the front end of a doubleheader against Stonehill on 3/29…Hit 10-for-21 (.476) over a six-game hitting streak from 4/5 through 4/13…Went 3-for-4, scored one run and drove in another at Assumption on 4/10…Knocked 3-for-4, scored one run, drove in one and stole a base against Merrimack on 4/13…Named to the Northeast-10 Weekly Honor Roll for the week ending on 4/13…Hit 2-for-4, scored one run, drove in another and stole a base in the first game of a doubleheader against Felician on 4/24…Went 2-for-4 and drove in a run in the second game of a doubleheader against Bentley on 4/27…Went 2-for-3 with a walk in the second game of a doubleheader against Saint Michael’s on 5/1. Before Franklin Pierce: Played at Arlington (Mass.) High School…Four-time All-League selection…Team MVP as a senior…Named school’s Outstanding Male Student-Athlete Scholar award as a senior…Team captured division title during his junior season…Also played hockey at Arlington. Personal: Son of Maria and Peter Hood…A sports and recreation management major…Has a younger brother, Ryan. New England Ravens Baseball Coach Aric LeClair was called out by Ravens Tyler Coppo to participate in the ALS ‘Ice Bucket Challenge’. 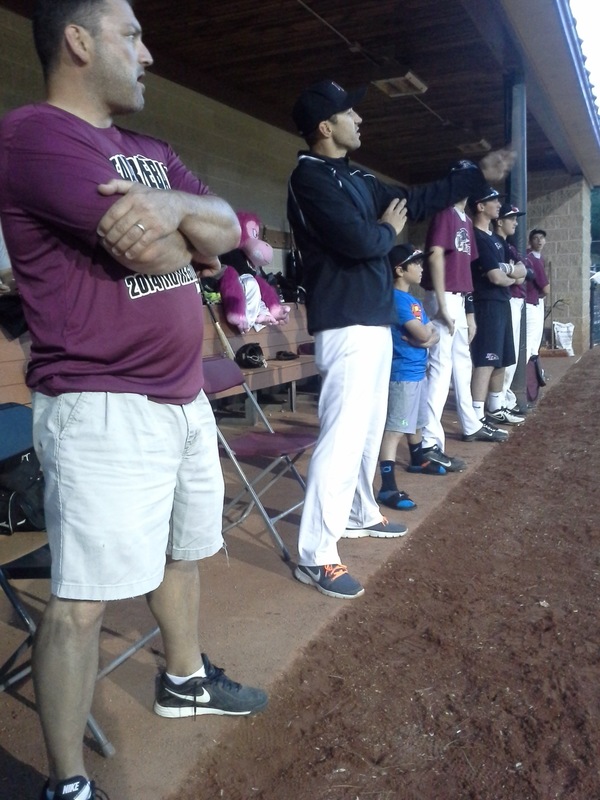 LeClair, a former left handed pitcher in the Arizona Diamondback and Kansas City Royals organizations, recently took a different type of challenge to Dr. Arthur & Martha Pappas Field when he pitched against the Chinese Tiapei team. The four inning performance against the fourth ranked team in the world was a dream come true as LeClair topped the radar display at 91mph. Coppo, who called LeClair out, was originally challenged by Ravens Coach Al Dinardo. LeClairs Ice Bucket Challenge will take place Friday night, 7:00pm at Dr. Arthur & Martha Pappas Field. Besides LeClair fulfilling his financial obligation, the Ravens will have a donation cooler at tryouts and LeClairs employer and New England Ravens Baseball supporter Fairfields Auto Group will match all monies donated to the ALS cause. Help fill up the bucket to support a great cause and watch Coach LeClair get doused with an ice cold cooler FULL of water….Friday 7:00pm. 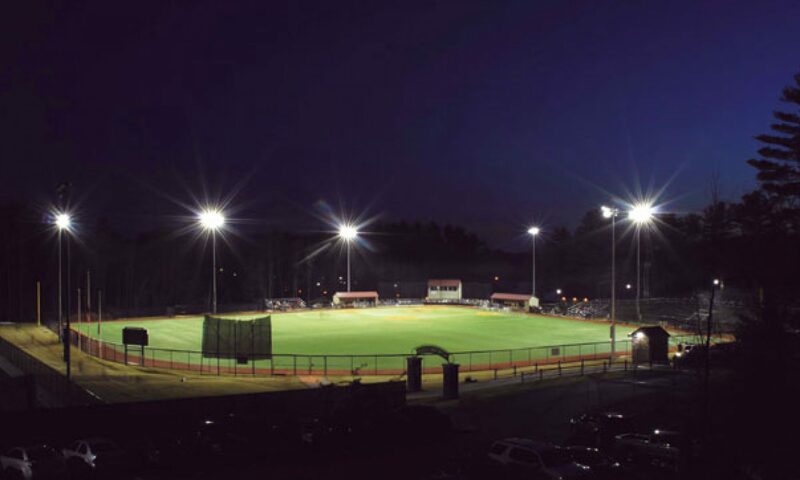 Willamantic Ct. ~ J.Coppo…The New England Ravens 18u squad saved their best for last as they squared off against the Central Connecticut Rebels at the Dream Bat tournament at Eastern Connecticut State University in the championship game. The Ravens earned the #1 seed ranking by allowing 2 runs in the pool round. The Rebels allowed 4 in pool play. In the early semifinal game, the Rebels outlasted the Providence squad 4-3 in 13 innings, for the right to face the Ravens and a shot at winning the covented Dream Bat trophy. 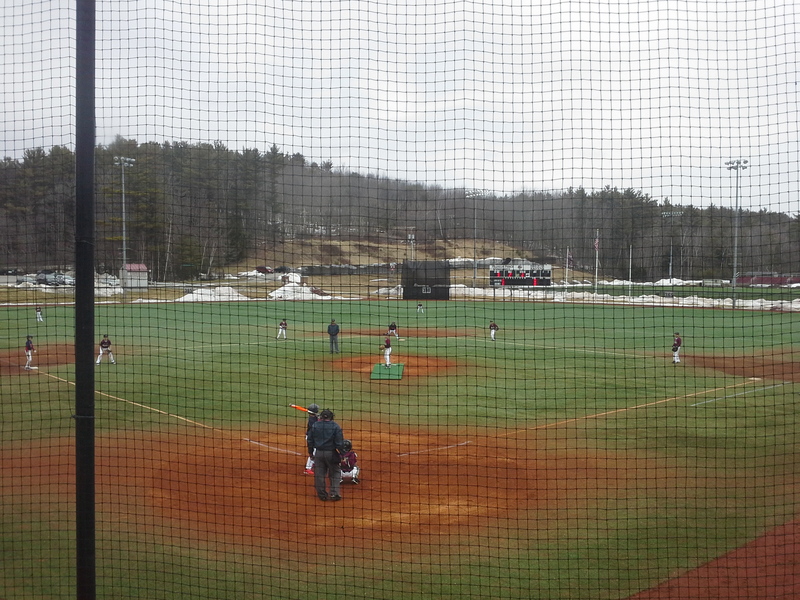 The Rebels attacked first, plating 3 runs in the top of the third. The Ravens were able to muster a pair in the bottom of the 4th and looked as if they were getting to the tall right hander. The Rebels, 4 hits on the day took advantage of a New England miscue and plated an insurance run in the top half of the 6th. The Ravens right hander Tanner Putnam went the distance, allowing just 4 hits, striking out 7 and walked 1. New England pounded out 8 hits, Mike Fogarty (2-4), Cam Casper (double), Tanner Putnam, John Friday, Matt Tierny, Tucker Obrey and Cam Riley all added hits for the Ravens. Willamantic Ct.~ J.Coppo; The 18U Ravens, behind a complete game extra inning gutsy pitching performance by Ravens pitcher Anthony Sylvester and timely hitting by Zach Lippert and Hudsen Hagland lifted the Ravens past host Dream Bat Bombers 4-1 in the Dream Bat Tournament. The Ravens trailed 1-0 entering the 7th and only mustered two hits off the host team before Hagland reached on a single and scored on a Lippert fly ball to right centerfield knotting the game at 1-1. The tall right hander Sylvester was in control as he held the DB Bombers to 4 hits on the night. In the extra frames, both teams battled in the eighth, putting runners on, but it was crafty leather on both sides that prevailed. In the top of the 9th Hagland ripped his second hit of the night, Steven Hall reached on a bloop hit to center before Cameron Casper dropped a perfectly executed bunt that set the Ravens Express into motion. With the bases loaded, 2nd baseman Cam Riley popped an infield fly in shallow right field. The Bombers, confused, attempted to throw to an un expecting 3rd baseman in an attempt to catch a leaning Ravens baserunner, allowed the ball to roll into the Ravens dugout. The miscue put the Ravens up 3-1, before Lippert belted a line drive to left putting the Ravens up 4-1. 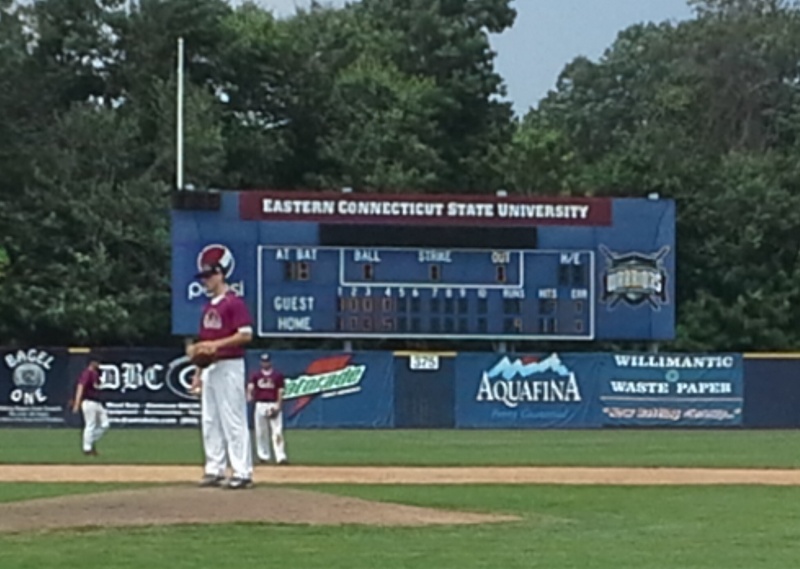 Sylvester got brillant defense in the bottom of the frame as Tyler Coppo, Cam Riley and Tanner Putnam all reeled in balls to preserve the extra inning Ravens rally and send them to the championship game at 4:00 at Eastern Connecticut State University. Matt Tierny displayed flawless defense snagging several line drives and turning two double plays. The Ravens, 2-0 moved to the championship round as the #1 seed because they allowed only 2 runs and scored 13. They’ll await the winner of the 11:00am semifinal contest. 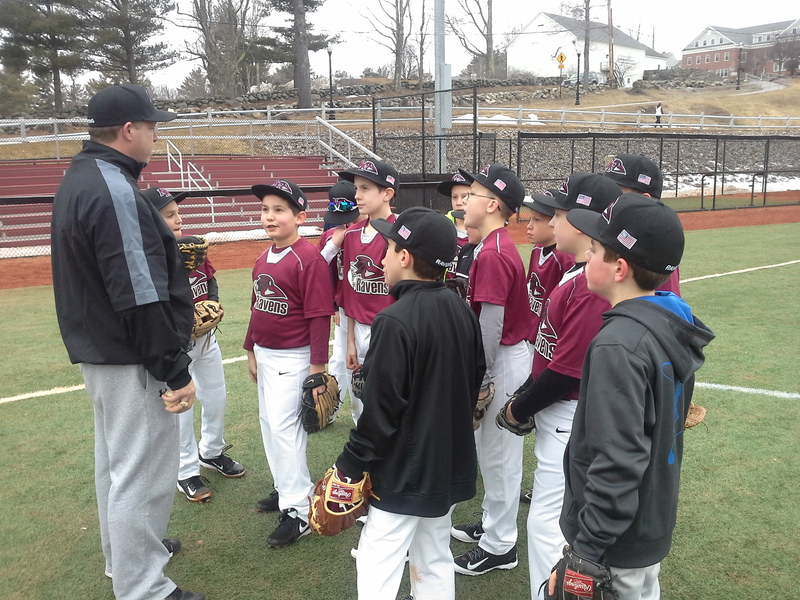 JIM COPPO – Rindge, New Hampshire….The New England Ravens 11U team took to Dr. Arthur & Martha Pappas Field on the campus of FPU for their season opener vs. the Red Wings of Londonderry in a non divisional tilt. The Ravens jumped out early by scoring a pair of 1st inning runs and held Londonderry scoreless thru 3 innings before the Red Wings tied the game at 2 in the top of the 4th. Casey Jordon got the start for the Ravens and pitched a perfect two innings before giving way to Patrick Forbes who pitched the 3rd and 4th before he gave way to Luke Beard. Beard was summoned to the mound by Coach Al Dinardo with no outs and the bases loaded holding a 2-1 lead. After walking in the tying run, Beard worked out of the jam with a pair of strike outs and ground out. The Ravens then went to work by plating three runs on 4 hits in the bottom of the 4th to take a 5-2 lead. The Red Wings quickly responded with a pair of their own to pull with one, 5-4. The Ravens, behind closer Justin King who put the hammer down, struck out Londonderrys #4 hitter Matt Veneri & #5 batter Zack Rheault before fielding a dribbling grounder off the bat of Londonderry pitcher Anthony O’Donnell and fired a bullet to 1st baseman Sebastian Mexico to record out number 3. King after a huge fist pump, headed to the dugout. He then helped his own cause as he belted a two run single to right center that sealed the victory. The Ravens scored 5 runs in the 6th to take a commanding 10-4 lead. 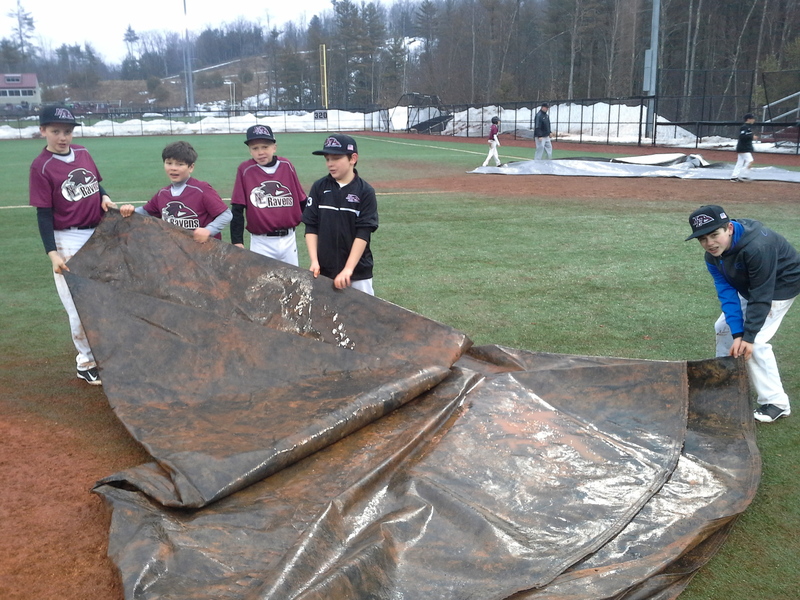 The full offensive Ravens game was on display as they pounded out 10 hits and stole 8 bases. The Ravens are off until next Saturday when they’ll host a divisional DH vs. N.E. Orange. First pitch is scheduled for 5:00pm. The Ravens are 1-0. Luke Beard recorded the win and Justin King earned the save. Battery mates were Anthony Dinardo and Preston Kirby. 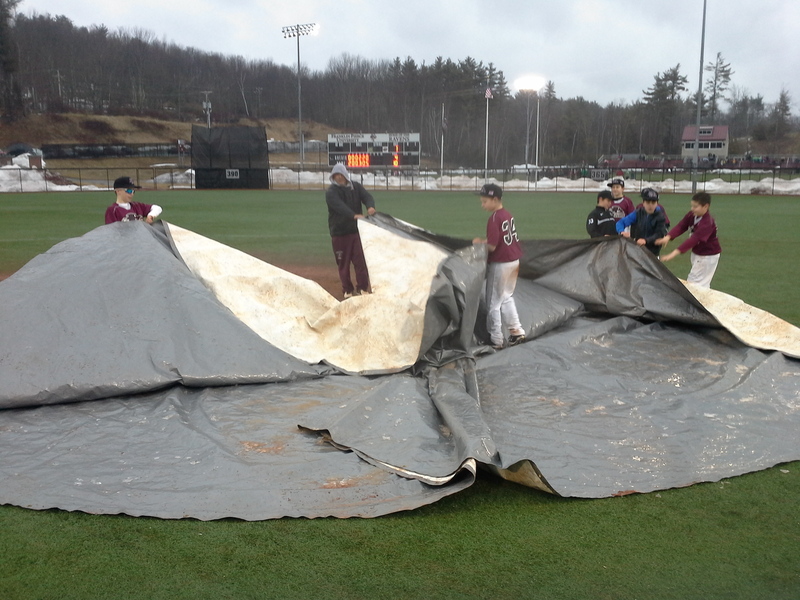 Sundays DH vs Pawtucket R.I. is cancelled due to anticipated wet weather and field conditions. A rescheduled date will be posted once the game has been rescheduled. All game schedules, game recaps, highlights and stories can be found at neravens.com and sportsnh.com. 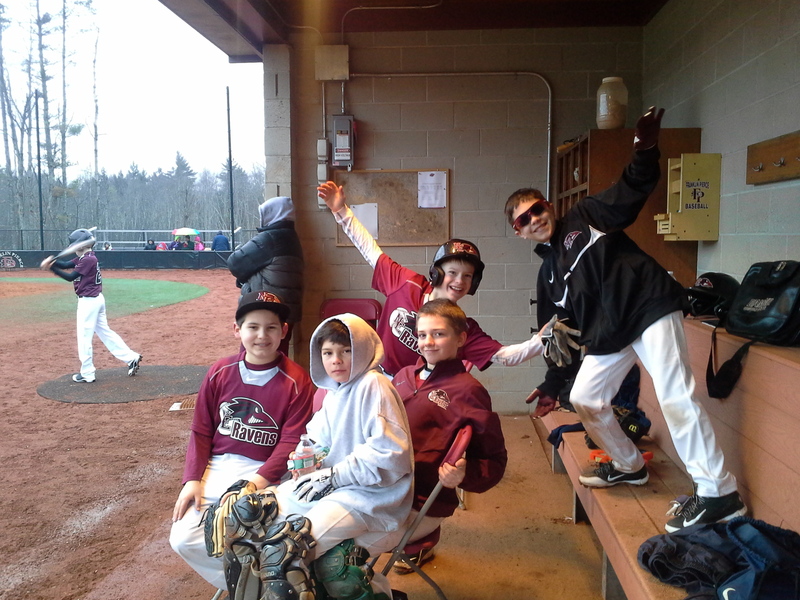 At sportsnh.com, go to the youth sports bar, scroll to the right and click the N.E. Ravens link. Tyler Coppo of the 2013 National AAU Championship runner-up team put together this slideshow to highlight their tremendous season and a once in a lifetime opportunity. JIM COPPO – The following is a reflection of the journey that most dream of, let alone experience!! A year ago we set the wheels in motion with a mixture of returning players and new recruits. We knew it was special, however we never expected this. We never dreamed that our journey would take us on a path that would make stops in places like the New Hampshire State House, Fenway Park, Northeast Delta Dental Stadium, Historic Terry Park, all the Red Sox spring training facilities, Hammond Stadium, plus championship game appearances in every entered tournament, and hosting the AAU New England Regional tournament. Our own 20 team tournament. Every game went on schedule, and we were again playing in the championsjop game, against a very tough Cape Cod team in front of a full house. It all happened because of our people, all very special. Kudos…The 45-5 record when we departed for the AAU Nationals wasn’t a fluke, it was a direct reflection of our guys, the guys who went to work everday, had tremendous passion and were simply a joy to be around. They made us look good, cared about their team and had a desire that was unbelievable to be part of. As the wins started to pile up and the competition became tougher we knew that we would be tested, however the more we were tested, the more our guys worked, and the results were always the same. From opening weekend, at the New Hampshire Bobcat Classic and a championship game appearance till the end at the the AAU Nationals, and yet another championship game appearance, the guys showed class, pride and determination. The end result, a National Runner Up trophy and an AAU National Sportsmanship award. The memories along the way, visiting with N.H. Governor Maggie Hassan, playing at Northeast Delta Dental Stadium, having an on field sendoff in front of a full house at a New Hampshire Fisher Cats game and then being congratulated for their accomplishments at the same venue, walking thru the center field entrance onto Fenway Park in front of 33,000 people, meeting professional baseball players, spending time with Ryan Kalish and Molly McGrath, and watching as our guys walked onto City of Palms Park on Championship day are all memories that I’ll have and cherish forever. Teams, coaches, media, friends, The New Hampshire Fisher Cats, (players and staff), our beloved Governor, many, many people became fans because our guys were on a journey, a journey reserved for special people. As the ride continued and the hype grew bigger, more people embraced our team because our guys were truly special. I’ll never forget the drives to the ball park every weekend, the classy Mothers Day recognition, the flowers, hugs and tears, the pink Cancer awareness games and even wearing those uniforms in Florida, and the comments that followed. I’ll always remember handing the ball to Sammy Fairbanks before the Championship game, telling Sammy Cooper, this is where champions were made, trying to get out a pregame chat in the tunnel where many Red Sox players and coaches have graced and then looking into our guys eyes as they watched another team celebrate a heart breaking extra inning victory. I merely said to them, I don’t know what to say, I didn’t prepare for this, because I too, truly believed in them. Then finally, just before the Nationals award presentation, I was called out to accept a special award..the National AAU Sportsmanship award. For the record, I’ve never coached to win that award, but humbled, I accepted it. Proud would be an understatement. As much as it hurt to fall short we did things not many, regardless of talent, ever get to experience. For the rest of their lives, they’ll have memories they can share, and as we prepare for 2014, know that our journey will continue. The logo on their jerseys is special, our facilities are special and what our guys accomplished will forever define the true meaning of being a New England Raven. They learned how to win, knew how to win and became winners in every sense of the word regardless of any score. Congratulations on a great 2013, you’ve helped the New England Ravens soar above the rest…. THANK YOU!